In his fifteenth book, The Sandcastle Girls, he brings us on a very different kind of journey. This spellbinding tale travels between Aleppo, Syria, in 1915 and Bronxville, New York, in 2012—a sweeping historical love story steeped in the author’s Armenian heritage, making it his most personal novel to date. 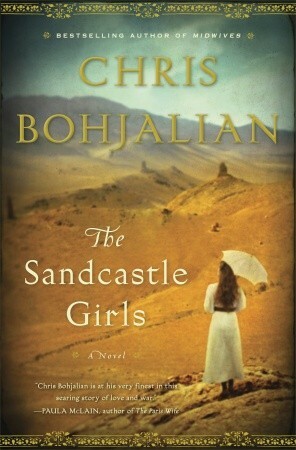 One of the books I was most looking forward to reading this summer was THE SANDCASTLE GIRLS by Chris Bohjalian. I have read quite a few of Ms. Bohjalian's novels and I've never been disappointed. I have always found that his stories are gripping and his characters very memorable; and in the case of THE SANDCASTLE GIRLS, both of these things were true. This novel about love and war was extremely moving and most definitely taught me a thing or two about the genocide of the Armenian people in the early 1900s. THE SANDCASTLE GIRLS tells the story of two very interesting women separated by almost one hundred years. Elizabeth is a recent college graduate who has volunteered with the Friends of Armenia to help distribute aid to the refugees from the Armenian genocide. While working in the war-torn country, she's sees some horrific things, but she also manages to find some goodness in a young and widowed Armenian man named Armen. When Armen leaves to join the British Army, Elizabeth keeps in touch with him through letters and hopes for the day when they might be reunited. The novel also features Laura a novelist who lives in present day New York who is researching her Armenian family's background. Despite not giving too much thought to her Armenian heritage, when a friend shares that she saw a newspaper photograph of her grandmother, Laura is driven to learn more and delves deep into her family's past and their secrets. For those of you familiar with Mr. Bohjalian's writing, you will certainly know what I mean when I say this book encompassed everything I've come to know and love about his stories. I found the entire book to be very interesting especially since I knew little about the Armenian genocide, and the characters he created were so complex. In addition, I loved how he presented the stories of these wonderful women. The novel went back and forth between 1915 and the present, and I was impressed with how he tied in Elizabeth's stories to her letters that Laura was reading. I do have to warn you that while THE SANDCASTLE GIRLS is an extremely powerful book, it's not one that's always easy to read. This novel deals with the horrors of war and genocide, and parts of it made me very uncomfortable. I will tell you that, at times, I was sick in my stomach reading about the atrocities and the more vile aspects of human nature -- much like I feel when reading books about the Holocaust. However, this book wasn't all depressing. It also demonstrated the goodness, beauty, and resilience of individuals. Elizabeth and Armen's love story was wonderful and deeply touched my heart; and Laura's quest to learn about her family also made me appreciate how linked we are to our past. There were other minor characters who also demonstrated the true goodness in people by the help they gave to those in need or the chances they took to save them. In fact, the characters in THE SANDCASTLE GIRLS made me appreciate the sacrifices that my ancestors made not only for themselves and their survival, but also for their future generations. It was obvious to me that Mr. Bohjalian did a thorough amount of research on the Armenian genocide and the effects it had on the refugees and survivors. His descriptions of the horrors were incredibly vivid, and there were many passages that remain in my thoughts because they described the tragedies of war so well. However, it was also apparent that this subject matter was one that was near and dear to his heart. Mr. Bohjalian (note the -ian at the end of his name) chose to write this book about his Armenian heritage at a perfect time since the centennial of the genocide is approaching. I can think of few books I've read recently that would be more interesting to discuss that THE SANDCASTLE GIRLS. Naturally, there is a reading guide available with fourteen questions; and I found them to be quite intriguing. Some of the topics you might want to explore include the effects of war, love, loss, grief, motherhood, family, loyalty, revenge, immigration and assimilation, the oppression of women, and man's ability to survive. There are probably ten more themes I could list, but I think you get the idea. This novel is perfect for book clubs! I adored THE SANDCASTLE GIRLS. While it wasn't always an easy read, I do think it's an important novel and one that I highly recommend. I know so little about this time in history, but got a taste with The Gendarme. And of course I know that the author can write a mean book because i LOVED The Night Strangers. This has been getting a lot of love, so I'll have to see if I can snag it on audio. I do know a little about the Armenian genocide from The Gendarme, but not nearly as much as I should. This book sounds wonderful. I can't wait to read it. This book is on the TBR pile for sure! This does sound wonderful! Definitely adding it to the TBR! This book sounds amazing! Thanks for such a great review. I can't wait to read it. I've been anticipating this book as well! Glad it didn't disappoint! Oh yay. I just loved this -- difficult and powerful. Did not know he had 15 books to his name - I have oly read Skeletons, have Midwives on the shelf (two copies - bought it twice by mistake! ), and this one sounds so good too! I just got this in the mail today! I'm glad to hear it's good.